You know what? This stuff actually works. I had an MRI last week, and the good news is that the tumor has shrunk. Significantly. To just over one-third of its original size. And my lymph nodes all look normal. Which they did not before. I was confident before that things would improve, and that science rules. But it’s so lovely to actually see the results. I still have plenty of chemo to go, but we do know that we are on the right track. For sure. Meanwhile, I sort of overdid things last week, trying to get my Day-Job ready for me being out for an extended period. This involved lots of sudden creation of documentation for the more arcane procedures that I do weekly and monthly. The company did not bring anyone in to cover my work — they’re just shifting it around to other people. All these other people have jobs of their own to do. I’m not sure how high a priority they’ll make the additional tasks. I suppose that time will tell. So, I actually put in over 40 hours last week, including Saturday, which did wear me down some. But as of this week, I’m out of the office for a good long time. On Monday, we switched chemo from one combination (Adriamycin plus Cyclophosphamide, called AC) to another (Taxol plus Herceptin, called TH), but since the side-effects of chemo do accumulate, I’m still feeling the build-up of all that AC. I’m very run down, and this is a week were a lot of sleeping is taking place. Reading is tiring this week (as is concentrating), so I’m mainly doing audiobooks. What I’m listening to: Girls Like Us: Carole King, Joni Mitchell, Carly Simon & the Journey of a Generation, by Sheila Weller. I mainly bought it because of Joni Mitchell, who was so, so influential in my life; but I’m finding Carole King’s story just as fascinating, and Carly Simon’s illuminating in a different way. King was lower middle-class/working class, Mitchell was solid, stolid middle-class Canadian Prairie, and Simon’s background was upper middle-class, and very privileged. Between the three of them, serially and overlapping, they cover a period when women’s lives and what was possible for women to accomplish were changing wildly — and the hippie culture, and drugs, and birth control were all coming in around the same time. The author, Sheila Weller, is a bit uneven, occasionally overblown, and seems sometimes to heavy-handedly speculate towards the most dramatic interpretation of ambiguous events… But mostly she’s fine, and is revealing exactly the sort of information I want to hear. Ebook update: No ebook update this week, sorry to say. Just too beat to accomplish anything worth reporting. Next week is an off-week for chemo (only the H of the TH combo), and I’m hoping to get a bit more energy in the next few days. Lastly: Here’s a TED talk I liked when I first heard it, recently heard again, and found I still like it just as much. I finished my offering for the Con or Bust auction, and it’s up for bidding right now! These are the trade paperbacks, published by Del Rey. 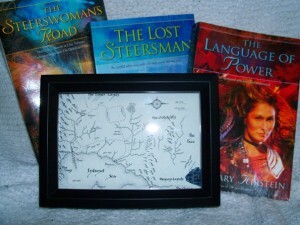 The first book, The Steerswoman’s Road combines The Steerswoman and The Outskirter’s Secret in combination, so with these three books you get all four volumes of the series. The map is Rowan’s world as of the beginning of Book 4, so it includes the Dolphin Stair from The Lost Steersman. The map is framed in a shadowbox, and I’ve included an example of the so-called jewel that started the whole story back in Book 1. Secret fact not mentioned on Con or Bust, known only to you: the paper on which the map is printed was hand-made by me, back in my paper-making days. I think it came out pretty nice. And I’ll include a blank sheet of that same paper for your own use. And naturally, I’ll autograph the books at your request. You can choose just the autograph and date, or I’ll personalize it (“To YourNameHere, SomeNiceComment, etc.”) Sometimes people don’t want autographs to be personalized, since it affects the book’s resale value — and these books are now out of print, and very hard to find. So, if you want these, head over to the Con or Bust auction, and put in a bid. Bidding ends on February 23 at 5PM Eastern Time. And while you’re over there, browse through the other items up for auction. There are some lovely, interesting, and exciting items and services donated by all sorts of people. If you look at the tags list in the right-hand column on the Con or Bust page, you can browse by categories — or you can just continue to click through page after page of random cool stuff (my preferred method of exploration). And don’t forget Delia Sherman’s auction offering: a critique of your novel, via Skype! Snow day! Plus: halfway through chemo. Extra flash: Delia Sherman’s Con or Bust offering! No work today! I was not up to driving to work in this mess, nor willing ask my poor sister risk life and limb hauling me off to the day-job. I stayed home, and mostly worked on the proofing for The Outskirter’s Secret ebook — kindle version. (Sorry Kalessin — and other non-Kindlers! It’s about all I can handle at the moment.) And it’s quite weird how many oddities of formatting show up from what looks like a clean copy, once it’s actually compiled. Some back and forth is required. 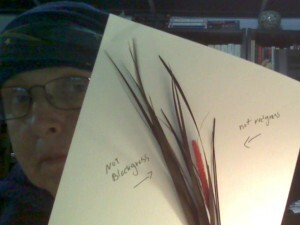 For the non-Kindle formats, I’m going to try to recruit some assistance — about which, more soon. It’s become clear that in my current compromised state, I just can’t handle everything myself. Chemo number four was on Monday, and again it took a little more out of me than the previous, and the effects are lasting longer. But as of now I’m halfway through the chemo process, so even while it’s getting harder, the end is in sight and approaching. My final pre-op chemo should be in early April, followed by chemo vacation! Four weeks with no chemo, in preparation for the surgery, in May. I’m gettin’ a little tired of the steroids, too — they pep you up, but they also puff you up, and I’m starting to feel like a stuffed sausage! For four days. Then I go back to normal. Except, sleepy. I’m missing more and more day-job days. Next week I’ll have some talks with Human Resources and discuss time off, and short-term disability issues. Everybody at work thinks I’m nuts for still going in most days, and I’m starting to come around to their way of thinking. Might be time to regroup and hunker down. In other news: hey, it’s Con or Bust auction time again! Con or Bust helps people of color/non-white people attend SFF conventions (how to request assistance; upcoming cons). It is administered by Kate Nepveu under the umbrella of the Carl Brandon Society, a 501(c)(3) not-for-profit organization whose mission is to increase racial and ethnic diversity in the production of and audience for speculative fiction. Con or Bust isn’t a scholarship and isn’t limited by geography, type of con-goer, or con; its goal is simply to help fans of color go to SFF cons and be their own awesome selves. Con or Bust is funded through donations and an online auction held each February. Every year I’ve offered something for auction – I don’t want to miss this year, but I’m way behind (because, as the saying goes, reasons). I might not be able to get a hand-bound blank book done in time, but over the weekend I will put up something, possibly involving trade paperbacks and maps. HOWEVER — Check this out! Delia Sherman (of my old writer’s group the Fabulous Genrettes) also has something up for the Con or Bust auction and it is: a critique of your novel. She will Skype you to do this! That’s how cool she is. This is a rare opportunity, folks. Delia is an amazing writer, teacher, font of wisdom. She does adult fantasy, YA fantasy, interstitial. She’s edited anthologies — She knows her stuff. You should go and bid. When will you ever get a chance like this again? As a member of the Genrettes, Delia provided a lot of insight while I was working on The Lost Steersman and The Language of Power. I can’t praise her enough. Oh, and other authors are also offering critiques of stories or novels in the auction. Here’s the list — and it’s impressive. Well. Must go now. Getting kinda worn down, and it’s day-job again tomorrow. Then snooze most of Saturday on my steroid crash. I want to thank everyone for the comments and emails of support and encouragement. I’m not able reply to each one immediately; I hope you’ll be patient. Comments in this blog are likelier to get a quick response, just because it’s one-stop-shopping, so to speak. But it means a lot to me that you’re out there; I can’t thank you enough. I did finally manage to reply to every comment made on my original post about the cancer. So, if you commented, and you don’t know if I’ve replied — check back on the post. So, I’ve missed more of the Day-job work days. But I did manage to do the all-important sending out of 1099’s to subcontractors. A task which only I seem to know how to do. It’s not a big company. I’m trying to prepare them for the fact that at some point, possibly soon, I’ll need to be out for extended periods. Fortunately, we have short-term and long-disability insurance. I’ll be having Conversations with HR in the coming weeks. 1. The map. Each book has a different map. Fortunately, they are all based on the Secret Master Chart which contains much more of Rowan’s World than anyone has seen. The idea is that each book’s map shows Rowan’s world as she knows it at the beginning of the book; taken in sequence, you can watch her explorations and knowledge grow. This was less evident in the omnibus print version of The Steerswoman’s Road, since I had to combine maps from Book 1 and Book 2; but for the ebooks, the progression should be clearer. So: maps. 2. The cover. Fortunately, each book’s cover is based on the portion of the map pertaining to that particular book, with additional objects from the story. So, when the map’s done, the cover is half-done! Unfortunately, half is not whole, and I was seduced by the first book’s cover. It was so easy, and came together so swiftly! Piece of cake, thought I. I can do this. Alas, subsequent covers are coming together more slowly. With my time and energy limited, I’ve bowed to necessity, and I’m scaling back. I have to let go of the perfect accuracy I wanted and just go for the general impression, a more symbolic representation, along with as much good design as I can manage. I want these book to be available, as soon as possible. I might replace the covers with better ones down the line, if I can get some time. And as it happens, updating the cover is simple for ebooks. 3. Extra final proofing, which is currently underway. So we don’t have stupidities like “fWith” happening again. None of us want that. It’s hard for me to pin this down to an exact date. I frankly thought I’d have the second book out by now, at least. A bit of a learning curve as to what can and can’t be accomplished at this time, as I said. I’m trying to get it done before the chemo side-effects catch up with me. They’re closing in… but with the cover comprises, I feel like it’s doable.